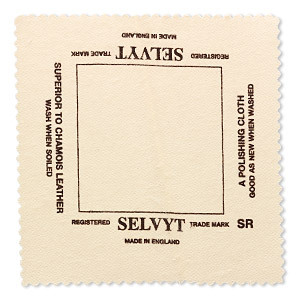 This is a two-sided polishing cloth. One side is coated with polishing rouge, and the other side is treated with a metal polish. This cloth is especially good for polishing gold jewelry. Note: Not to be used for plated items, because it can rub the finish off. Rub the metal with the rouge side first. Flip the cloth over, then polish and buff the metal with the yellow side to complete polishing. Fold the cloth over the necklace chain. Pinch between the thumb and forefinger. Pull the chain through the cloth. Repeat as necessary until you achieve the desired degree of polish. Fold the cloth over the item. Rub the cloth over the entire surface. There are 2 separate cloths: 1 for gold and 1 for silver metals and they come in large and small pads.